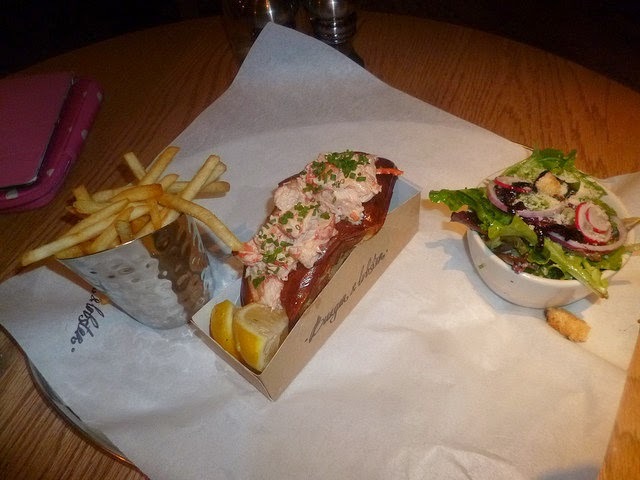 Forays of a Finance Foodie: Burger & Lobster: No Reservations, No Menus, No Apps…Just Simple, Hearty Fare! 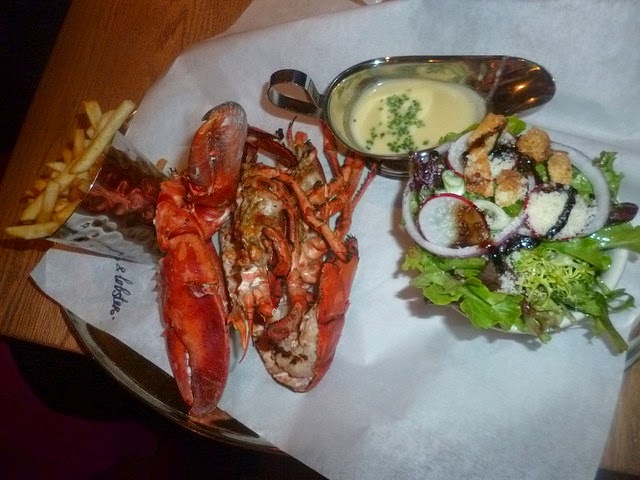 Burger & Lobster: No Reservations, No Menus, No Apps…Just Simple, Hearty Fare! Going out with a bunch of friends who drive you crazy because it takes them at least 15 minutes to decide what to order off the menu. Well, why not take them to a really fun place with great food where there is NO MENU! There are no appetizers, and your entrée choices are only a juicy 10-ounce burger, a whole 1-1/2 pound lobster (grilled or steamed) or a lobster roll; all come with delicious skinny-cut fries, and a salad. Well, the whole lobsters also come with melted butter on the side if you want me to be totally exactly. There are only two desserts but they will be changing ever two or three months. A super-reasonable 20 bucks gets you each items and desserts are only about six dollars extra! The wait staff is lucky that they do not have to handle menus or customers with too many questions, and there are no reservations accepted. The one thing you can upgrade on for extra bucks is the whole lobster. 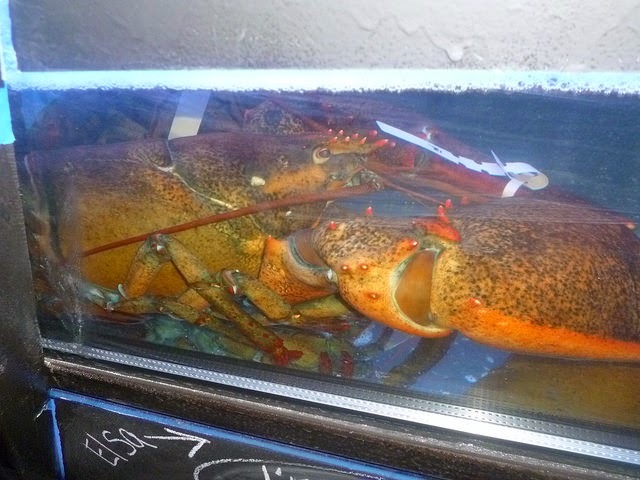 There are world class lobster tanks—or as the staff at Burger & Lobster call them, lobster condos—with much larger sized lobsters to select. You will be paying $20 per pound for them and one named Danielle in the tanks closest to the door ways in at a whopping 12 pounds and costs $240. I grew attached to Danielle and the other named lobsters in the front the minute I walked into Burger & Lobster for the first time and I hope that no one decides to make them into a dinner. They are kind of like staff pets at this point in time and a big attraction for the kids coming into B&L! An additional plus Burger & Lobster is over 7000 square feet and has so many tables that it would probably be hard not to show up and get a table; the space used to be a karate school. It looks like a large downtown loft space that has decorated by a lobster fisherman and then a decorator was brought in for some cool lighting; there is a general nautical theme along the outer walls of the dining area. 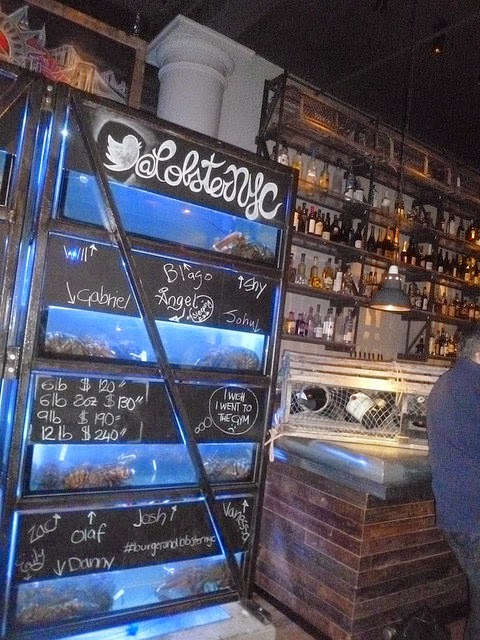 There are lobster traps used as décor all over the place and the type of large wooden bar fisherman would like to hang out after a long day of work. So how was each item? Let’s start with the burger, which is over and inch thick and served on a large sesame seed brioche roll. The meat is of excellent quality and you get all the toppings you want for no additional costs. That means you can get Cheddar, and American-Cheddar blend, onions, gherkin pickle slices, tomato, shredded lettuce and more! The fries are classic thin Idaho potatoes fried fresh in a canola oil blend; the portion size is about 40 to 50 fries (just right)! The salad is small and done very simply—organic mixed greens, red onion, radishes, tomatoes, croutons and a simple dressing of lemon juice and EVOO. I would like to see other more adventurous dressings offered in the future, but this one’s a crowd-pleaser and served in the right amount. I understand that overseas the dressing is usually a combo of shaved Parmesan and a fruity olive oil. The dinners I spoke to who tried the whole lobster said that they ordered the grilled lobster because they like the smoky taste. You are served garlic butter with the lobsters and many people ask for a second helping to dunk fries or leftover bread from a lobster roll in. Affable executive chef Danny Lee—who had previous spent all of his career at the Blue Water Grill on Union Square—tells us that he gets his lobster from Nova Scotia rather than New England “because the colder waters there make the lobster meat juicier.” That is a fact that’s good to know when ordering lobster. The lobster roll is large and seems to have about 1-½ cups of chunked sweet lobster meat—half of which are coming out of the sweet roll! We got Lee to reveal why it tastes a little different than those overhyped Hamptons lobster rolls—he mixed Hellman’s Mayo with Kewpie Mayo from Japan in the dressing. The bread used is egg-based and looks almost like challah bread made into a roll. The two dessert choices were magnificent and medium sized—but very rich, so you didn’t really want anything bigger. The Berry Cheesecake is in a bowl and appears to have no crust but there are actually hidden chunks of Graham cracker crust in the mix. It is more like a mousse than a cheesecake. Lee and his crew mix cream cheese, crème fraiche and heavy whipped cream to get the dreamy texture. The variety of berries on top are juicy as can be with a not-too-sweet glaze you won’t soon forget! The “trick” to this one is that the graham crackers are crushed and mixed with brown sugar and butter and then baked…then broken up like “brittle” and put in the cheesecake batter. The Chocolate Mousse is served in the same size small chowder bowl (I would say the portion size of both the cheesecake and mousse is about ¾ cup. It is freshly made, ultra creamy and is not overly sweet as most chocolate mousses tend to be. It is also truly light and fluffy and is topped with fresh whipped cream and some chocolate shavings. Burger & Lobster is over 7,500 square feet and has so many tables that it would probably be hard not to show up and get a table; the space used to be a karate school. They played a lot of funk music from the 70s while my dining partner Gail and I were there and they have no problems serving large parties (a quiet and well behaved bachelor party of some sort was going on next to us). This is the kind of place you can satisfy any of your out of town guests with. The only people it does not cater to are vegans (they can really only have the fries, salad and desserts). The Burger & Lobster chain is a bit hit all over the UK, and is actually cheaper at the newly opened Flatiron location since the UK price is 20 pounds per meal and here it is just 20 dollars. There is also a special deal where you get three entrees and two desserts for $60. The wait staff is cool about people sharing and you will not be charged for extra plates. There is a combo deal of two burgers, unlimited fries and salad, a lobster or lobster roll and two desserts for $60. I will be going back for another giant burger despite a recent rise in cholesterol, LOL! The burger in itself is enough to make your belly explode! I also want to go back to see if my new lobster pal Danielle is still in the tank! Oh, did I fail to mention that I want to check out what two new desserts will be available in a couple of months?